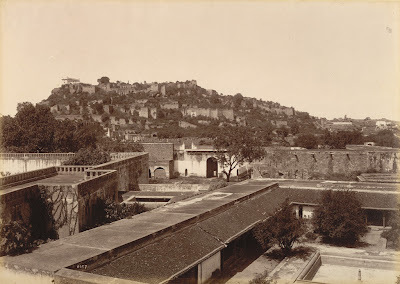 Photograph of the fort at Golconda, Andrea Pradesh, taken by Deen Dayal in the 1880s, from the Curzon Collection: 'Views of HH the Nizam's Dominions, Hyderabad, Deccan, 1892'. Golconda was a thriving commercial centre in the 13th and 14th centuries, but it was not until the 16th century that it became the capital and dynastic centre the Qutb Shahi dynasty (1512-1687). The fort, which pre-dates the 16th century, is situated on an isolated granite hill. The outer curtain wall of the fort is 4.8 km (3 miles) in circumference and incorporates a total of 87 bastions. Within this wall there is a second double wall which circles the town and an inner wall which encloses boulders and other natural landscape features. A number of notable buildings are situated at the fort including the Diwan's Palace and the Jami Masjid.